There are two major things to consider when you rate a phone's screen quality: how well you can see what's on the display and how good it looks. Both the Google Nexus 4 and Samsung Galaxy S III have Gorilla Glass 2 protecting their 4.7-or-so-inch displays, but this is where similarities end. The Nexus 4 has a True HD IPS Plus LCD screen with a WXGA (768 x 1280) resolution and full RGB stripe. The Galaxy S III uses a Super AMOLED screen with 720 x 1280 resolution on a PenTile matrix. LCDs are typically brighter and the Nexus 4 does indeed put out nearly double the lumens of the Galaxy S III when both are set at 100% brightness. The strengths of AMOLEDs lie in perfect blacks, which push contrast to infinity. The contrast of the Nexus 4 is finite but very high - 1341:1. In practice, 1000+ contrast is good enough unless you're in a very dark environment. The black levels are pretty impressive - comparable to a Nokia Lumia 920 or an Apple iPhone 5. The problem that the Nexus 4 screen has is that it's quite reflective - more reflective than the screen of the LG Optimus G, which was less than perfect to begin with. So, bright light greatly reduces the perceived contrast, affecting the image quality. The Galaxy S III on the other hand is one of the best performers we've seen in this category - its screen is not very bright, which hurts sunlight legibility, but the low reflectivity keeps things legible even in the brightest sun. With that out of the way, let's talk image quality. 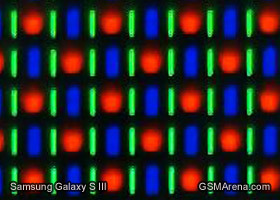 We already mentioned that the Super AMOLED screen on the Galaxy S III uses a PenTile matrix, meaning it only has two subpixels per pixel, while the Nexus 4 has three subpixels in each of its pixels. The two screens are pretty close in terms of pixel density (318 ppi for the Nexus vs. 306 for the Galaxy), but the subpixel density is a whole different story. The Nexus 4 has 56% higher subpixel density than the Galaxy S III. While at these levels PenTile isn't nearly as noticeable as it used to be, if you look closely you'll see that the Nexus 4 has the sharper screen. 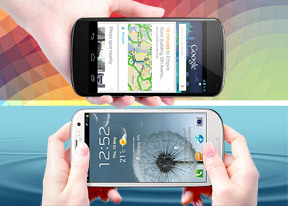 When it comes to color rendering, AMOLEDs tend to oversaturate colors and the Super AMOLED on the Galaxy S III is no exception. Samsung has provided a setting to control the color rendering, so you can tweak it to your liking. The Google Nexus 4 doesn't have such a setting, but its colors look natural and pleasing, so we won't complain. One area where we see room for improvement is viewing angles - the IPS Plus tech keeps color shifting to a minimum (though it's still noticeable), but there's a pretty sharp decrease in contrast when you view the screen at an angle. Another thing that came up during our Nexus 4 review is that the LG Optimus G - the base on which the Nexus is built - uses LG-sourced software tweaks to improve the image quality, which are not available to the Google phone. 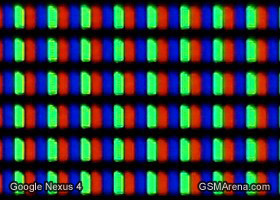 Images drawn to the screen are sharpened and there are adjustments to the color too, so the same image will have more visible detail on the Optimus G than on the Nexus 4. It's not like the Nexus 4 has a bad screen, but it miffs us to know that it could have been even better with the more advanced image rendering techniques of the Optimus G.
Winner: Google Nexus 4. The screen is bright and with good contrast and is sharper than the PenTile Super AMOLED. We just wish LG shared the secret sauce that made the Optimus G screen better. Simply comparing battery capacities would be largely inconclusive. Both the Google Nexus 4 and the Samsung Galaxy S III have 2100mAh juice packs, but their battery life is quite different as we found out from our tests. A quick side note first. The S III uses a standard Li-Ion battery, while the Nexus 4 has a Li-Po battery manufactured by LG Chem. LG promises that it will last more charge cycles than a traditional battery before it starts to degrade. That's good to know, because putting a fresh battery in the Nexus is no easy task. Voice calls are just one of the many features of a modern smartphone, but still an important one. The Google Nexus 4 posts one of the best times we've seen - just over 14 hours of talking before the battery runs dry. 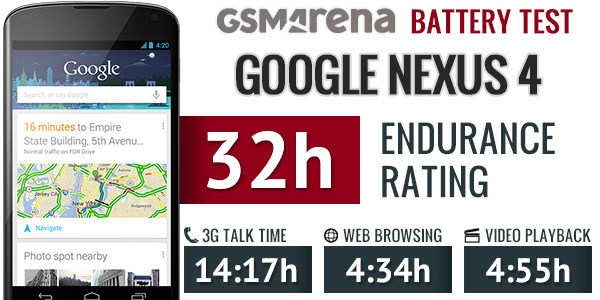 The Samsung Galaxy S III is not bad either with a bit over 10 hours of talk time, but the Nexus has a nearly 40% advantage. 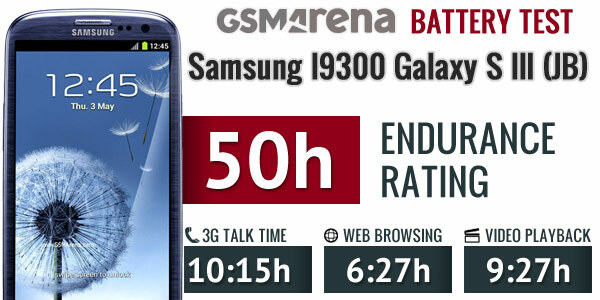 In our web browsing test, the Galaxy S III managed the respectable 6 and a half hours. The Nexus 4 managed 2 hours less. Keep in mind that we do the test over Wi-Fi and an LTE connection will drain the battery even quicker. We should note that the Nexus 4 has rather underwhelming web browser benchmarks and software optimizations might improve performance, which in turn will lighten the load on the four hungry Krait cores. The Galaxy S III may be a good reference - it gained over an hour by going from ICS to Jelly Bean. Other than web browsing, watching videos is the other area where a big screen is of a big benefit. If you're on a long commute or on a plane, for example, the Galaxy S III will last for nearly 9 and a half hours before the battery hits 10% (many phones refuse to play video under that threshold). That's enough for quite the movie marathon on a long transatlantic flight (note: we do the test in offline mode). The Nexus 4 is one of the worst performers in this category - it only took 5 hours before the battery reading showed 10%. We suspect the poor performance might be due to the relatively poor codec support - Google just doesn't consider that as a priority. While you probably won't watch a movie on the Galaxy S III for 10 hours straight, you can watch a three hour movie and have plenty of battery left over. Doing the same on the Nexus 4 will leave you with less than 50% charge, even if you started with a fully charged battery. When we tally the numbers and take standby efficiency into account, the Samsung Galaxy S III lasts a bit over two full days on a single charge in a usage pattern involving an hour each of calling, web browsing and watching video every day. The S III showed nearly double the standby efficiency of its competitor, too, which helped it achieve an important victory here. By comparison, the Google Nexus 4 lasts only 32 hours - it could get you through two work days, but you'll have to plug it in the second night. It will do great if all you do is voice calls, but with a 4.7" WXGA screen and S4 Pro chipset, you'll probably want to do some web browsing or watch HD video (we test with SD video) and that's just the kind of thing that brings the battery down quickly. Winner: Samsung Galaxy S III. It lost the talk time test, but with its time of over 10 hours is more than enough. In the other tests it beat the Nexus 4 outright.